Adding a little salt to each preparation will enhance the flavor. Since bulgur is a natural product, cooking time and water amounts may vary. Soaking Directions: One part #1 Fine grind bulgur to two parts boiling water. Add boiling water to bulgur; stir, cover and let sit for 7 minutes; drain excess water. Quick Cooking Directions: One part #1 Fine grind bulgur to three parts water. Bring water to a boil; add bulgur, boil for 2 minutes, stirring occasionally. Remove from heat, cover; let stand for 4 minutes; drain excess water. Microwave Directions: One part #1 Fine grind bulgur to 1-3/4 parts hot water. Stir and cover; microwave on high for 2 minutes, 15 seconds. Stir, cover and let stand for 7 minutes; stir again. Soaking Directions: One part #2 Medium grind bulgur to two parts boiling water. Add boiling water to bulgur; stir, cover and let sit for 15 minutes; drain excess water. Quick Cooking Directions: One part #2 Medium grind bulgur to three parts water. Bring water to a boil; add bulgur, boil for 8 minutes, stirring occasionally. Remove from heat, cover; let stand for 5 minutes; drain excess water. Microwave Directions: One part #2 Medium grind bulgur to 1-3/4 parts hot water. Stir and cover; microwave on high for 4 minutes. Cooking Directions: One part #2 Medium grind bulgur to two parts water. Bring water to a boil; add bulgur, stir and cover. Reduce heat to simmer; cover. Cook for 10 minutes while stirring occasionally; drain excess water. Cooking Directions: One part #3 Coarse grind bulgur to 2 and ¼ parts water. Bring water to a boil; add bulgur, stir and cover. Cook for 20 minutes, stirring occasionally; drain excess water. Microwave Directions: One part #3 Coarse grind bulgur to 3 parts hot water. Stir and cover; microwave on high for 7 minutes, 30 seconds. Stir, cover and let stand for 8 minutes; stir again. Quick Cooking Directions: One part #3 Coarse grind bulgur to three parts water. Bring water to a boil; add bulgur, boil for 9 minutes, stirring occasionally. Microwave Directions: One part #4 Extra Coarse grind bulgur to 3-1/2 parts hot water. Stir and cover; microwave on high for 8 minutes. Stir, cover and let stand for 9 minutes; stir again. Quick Cooking Directions: One part #4 Extra Coarse grind bulgur to three parts water. Bring water to a boil; add bulgur, boil for 15 minutes, stirring occasionally. Remove from heat, cover; let stand for 7 minutes; drain excess water. Cooking Directions: One part #4 Extra Coarse grind bulgur to 2 and ¼ parts water. Cook for 25 minutes, stirring occasionally; drain excess water. 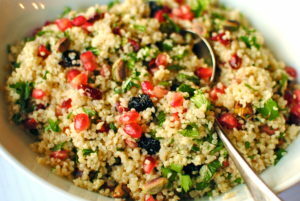 Cooking Directions: One part Half Cut grind bulgur to 2 and ½ parts water. Cook for 35 minutes, stirring occasionally; drain excess water. Bring bulgur to a boil in excess water (like you would for pasta) for 35 minutes. Stir occasionally; drain excess water. Bring Grano to a boil in excess water (like you would for pasta) for 35 minutes. Bring KAMUT® Khorasan Bulgur Wheat to a boil in excess water (like you would for pasta) for 40 minutes. Stir occasionally; drain excess water. Bring Farro to a boil in excess water (like you would for pasta) for 30 minutes. Bring Freekeh to a boil in excess water (like you would for pasta) for 30 minutes. Bring a medium sized pot of lightly salted water to a rapid boil as you would for pasta. Add desired amount of couscous. Let boil for three minutes; strain well. Let couscous sit for five minutes to absorb all water. Fluff with a fork and serve. Bring Pearled Wheat to a boil in excess water (like you would for pasta) for 35 minutes.